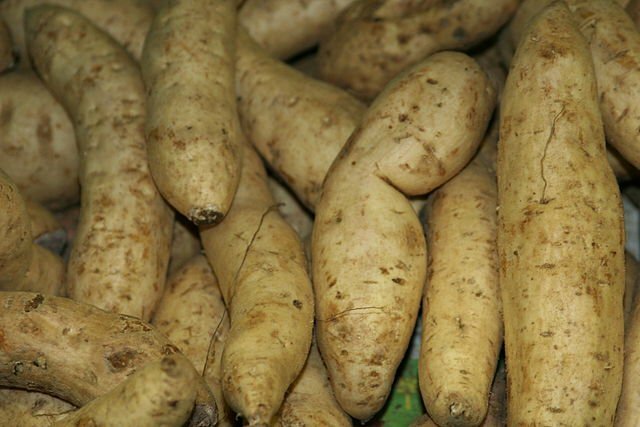 Yam is a versatile vegetable, consumed as a staple in the regions of Africa, Asia, Latin America, the Caribbean and Oceania. Yams can be barbecued, roasted, fried, grilled, boiled, baked, smoked and processed into a dessert recipe. Although some varieties of sweet potato are also called yam in parts of the United States and Canada, it is part of a different food family. Yam is a versatile vegetable from the genus Dioscorea (family Dioscoreaceae) that form edible tubers. The plant is consumed as a staple in the regions of Africa, Asia, Latin America, the Caribbean, and Oceania. Although some varieties of sweet potato (Ipomoea batatas) are also called yam in parts of the United States and Canada, it is not part of the Dioscoreaceae family. Yams can be barbecued, roasted, fried, grilled, boiled, baked, smoked and processed into a dessert recipe. Here are the 7 health benefits of yam. 1. Yams are perfect for helping decrease blood pressure. Yams have one of the highest amounts of potassium per cup among staple foods. Per cup, yams contain 1,224 milligrams or 35 percent of the daily recommendation for potassium. Also, yams contain very little sodium with only 13.5 milligrams per cup. This combination with folate also contributes to the reduction of hypertension and relaxes blood vessels, while maintaining proper blood flow. 2. Yams may improve brain cognition. Several components of yams, such as potassium, folate, and various antioxidants are known to provide neurological benefits. Folate has been known to reduce the occurrence of Alzheimer’s disease and cognitive decline. Potassium has been linked to increased blood flow to the brain and heightens cognition, concentration, and neural activity. 3. Yams can help improve heart health. Yams are rich in vitamin B6, potassium, and dietary fiber. One study suggested that individuals who consumed 4,069 mg of potassium per day had a 49 percent lower risk of death from ischemic heart disease compared with those who consumed less than 1,000 mg per day. 4. Yams are a wonderful source of manganese. Manganese is essential for many enzymes that control blood sugar, energy metabolism, and thyroid function. One cup of yams possesses 30 percent of the recommended value of manganese. Deficiencies in manganese could be associated with impaired fertility, growth retardation, congenital disabilities, and general weakness. 5. Yams can help individuals fight infections. Yams contain 43 percent of the vitamin C daily requirements per cup. Vitamin C is a powerful natural water-soluble antioxidant that helps the body develop resistance against infectious agents and eliminates cancer-causing free radicals in the body. 6. Yams are great for keeping the hair and skin vibrant and strong. Adequate vitamin C intake does not only improve the immune system but can also create and maintain collagen, an essential protein found in hair and skin. 7. Yams help aid the digestive system. Yams are a great source of fiber. A one-cup serving of yams contains 6 grams of dietary fiber. The daily recommended dietary fiber intake for men and women are 38 grams and 25 grams, respectively. Fiber aids can help prevent constipation, making your bowel movement easier to manage.